The Philippines is one of the top emerging tourist destinations of 2019. While still relatively under the radar, it is quickly becoming more noticed by mainstream media and tourists alike. This beautiful island country offers visitors a chance to discover an untouched tropical paradise, at very reasonable costs. What makes the Philippines unique to me is the culture mix it displays. Being under Spanish colonial rule for many centuries—combined with the proximity and heavy influence of China—has created a one of a kind Asian-Hispano mixture that is rare to find intact. Add to that the indigenous tribes and rich Malay folklore, and you get one of the most intriguing and diverse places on earth. What draws most people to the Philippines time and time again are the breathtaking islands. With more than 7000 of them, many are worth a visit. You’ll find hidden lagoons, private beaches, and stunning land-based attractions such as caves, lakes, and volcanoes. Choosing between all these wonderful places can prove a daunting task. I recommend loads of proper research before embarking. This article is a good place to start—good on you! I’ll be highlighting the most popular tourist destinations in the Philippines along with some tips once you’re there. Once you know where you want to go, it is time to plan your trip to the Philippines and make the most out of each place you visit. El Nido, a Philippine municipality on Palawan island is known for white-sand beaches and coral reefs. No single place encompasses the Filipino vibe better than Palawan. It is by far the best island in the country, and arguably in the entire world. The reason this island province won so much praise is twofold. First, it is a very large island with plenty of fantastic locations to choose from. This ensures any traveler who ventures there can find something they like. Secondly, it has some of the most amazing beaches and lagoons you’ll ever see. Palawan is divided into three major areas: Puerto Princesa, El Nido, and Coron. Puerto Princesa, the capital, is the most developed and the best island in the Philippines for families with kids. The main attraction here is the world-renowned Underground River national park. If you find yourself traveling to the Philippines for a honeymoon or romantic getaway head to El Nido. This quintessential honeymoon destination, famous for its island hopping, lagoons, and private island resorts will leave you breathless. Lastly, there is Coron, the more backpacker friendly location and a scuba diver’s dream. If you’re looking for something more remote, there are smaller islands and other locations which are only accessible through organized expeditions or day tours. You could easily explore the entire Palawan province in a week. Transferring between each location usually takes up at least half a day, so in a week long trip, that gives your two full days at each place you visit. This is surely enough to get a glimpse (but just a glimpse) of what each have to offer. For more relaxed itineraries, I suggest a minimum of 10 days. Beautiful white beaches are the main draw of Boracay in the Philippines. Boracay gives Palawan a run as the country’s most popular tourist destination. Funnily enough, while they both enjoy immense popularity, they could not be any more different than one another. While Palawan is a huge under-developed island with tons of hidden attractions, Boracay is a small island with a highly developed tourism scene. Boracay really resembles the party islands in Thailand. It is a tourist mecca, where you’ll have everything you desire at a hand’s reach. The hotels are fantastic and also cheaper than other similar locations around the world. What really separates Boracay from the crowd is the long strip of sand simply called ‘White Beach’. This beach is where all resorts are located, and is considered by many to be one of the most beautiful beaches in the whole world. The downside to Boracay is that activities here are often times considered subpar compared to other islands on this list. If you do decide to visit, the beach is the main, and almost only, attraction. It is still a fantastic place to visit for a stay of two or three nights. But, honestly, if you’re looking to just chill at the beach and party at night this may be the place for you. A perfect tropical paradise can definitely be found in Cebu, the Philippines. Next up on the list is Cebu island, one of the largest and most important provinces in the Philippines. The provincial capital, Cebu city, is the second largest city in the country right after Manila. The whole island is also filled with small towns and villages that provide different opportunities for adventure or luxury. Another major benefit of stopping by in Cebu is the fact it is very easy to reach other, smaller islands nearby from there. Cebu city feels more like an overpopulated village than a large metropolitan. While staying there, don’t expect to enjoy all the perks that usually come with staying in a large city such as this. In fact, this is why most tourists choose to stay at the nearby island of Mactan. Here you can find dozens of fantastic beach resorts and be a bit more comfortable. If you want to be adventurous, another option is to stay at one of the smaller towns. Even though this means you’ll need to drop your standards a bit, the upside is quite clear. Moalboal is the most popular out of these—a relaxed beach town with good nightlife and cozy beach resorts. The main attractions there are Kawasan Falls, canyoning, and snorkeling with the sardines. A great choice for couples visiting the Philippines is Malapascua island with its stunning secluded beaches, high-end resorts, and excellent diving spots. 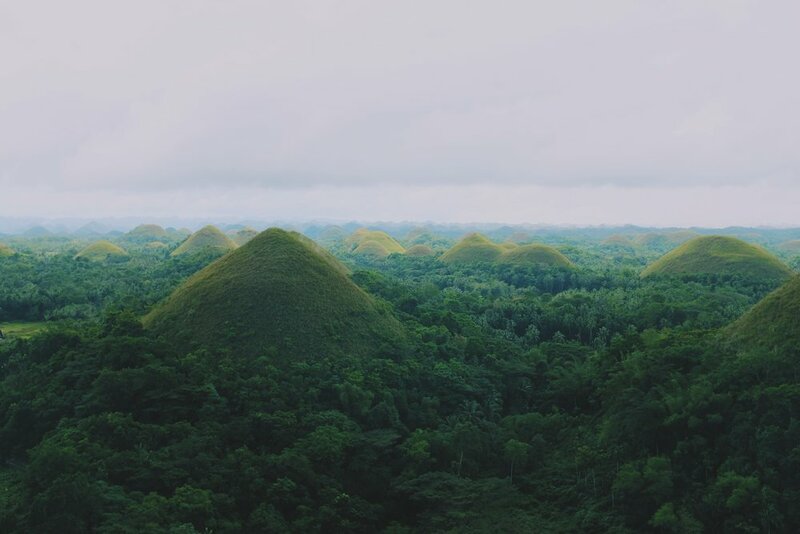 Chocolate Hills in Bohol are a must see in the Philippines. Above I mentioned that Cebu is a gateway to many nearby islands. The most popular out of these is Bohol. This island has become extremely popular in its own right. So much so that recently a new international airport has been opened there. Now you can reach Bohol directly from several Asian countries. Even with the airport though, many people still choose to take the two hour ferry from Cebu to Bohol instead. Bohol’s main area is called Alona Beach, a fantastic beach that rivals that of Boracay’s, both in terms of attractiveness and also the attractions it holds. The whole area is full of restaurants and bars that are fantastic! Additionally, Bohol offers a lot of exciting day tours such as island hopping, the Chocolate Hills and world-class diving spots where you can see a large population of sea turtles. Lastly, there is Siargao island. While all other entries on this list are well-established tourist hotspots, Siargao is the next big thing. Up until recently it was a hidden gem and served mostly as a surfer’s paradise. Recently though, a new airport opened offering domestic flights from both Manila and Cebu. This almost immediately catapulted Siargao into the number one tourist destination in the whole country. The downside though is Siargao was not well prepared for the surge of incoming visitors. Good resorts are still hard to find (even mid-range), and the infrastructure is lacking. If you do wish to go there, it is better to book very far in advance or you risk not having a decent place to sleep. If you are looking for luxury, this might not be the ideal choice for you either. The only place which offers high-end accommodation is the Isla Cabana resort. It sells out quickly though since it only has a few dozen rooms. But, what Siargao lacks in accommodation, it easily makes up for in other departments. First of all, the backpacker and surfer vibe is really evident everywhere you go, and it makes the whole island a truly fun place to visit. Nightlife and food options are all very good and also extremely cheap. More importantly, the attractions in Siargao are amazing and nature is often compared to Palawan’s in terms of raw beauty. Plan a stopover in Hong Kong before heading on to the Philippines. I hope this list not only gets you excited to plan a vacation to the Philippines but also helped you narrow down where to go. You are about to embark on a once in a lifetime adventure! My last word of advice is to note that flying to the Philippines can be quite difficult. It’s a long flight from the US, and deals are hard to find making it an expensive trip. One way to avoid this is traveling first to a nearby Asian country for a few nights and then flying to the Philippines from there. Personally, I suggest if you’re coming from the US you travel first to Hong Kong. Flights are abundant and solid deals can be found, not to mention it is one of the most interesting places in Asia. The best part is Hong Kong’s urban attractions and atmosphere compliment the rural experience of the Philippines really well.